A while ago, when writing about my style of cooking, I said it was “utilitarian,” meaning purely functional, without emotion–prep, cook, wash up with all speed and efficiency. When I wrote that, I was thinking about famous chefs and gourmands waxing euphoric about the smells, tastes and associations they have with their favorite ingredients and recipes. That gushing has always irritated me, but beneath my aversion to gushing is a complicated and very emotional relationship to food. Like most Americans, food is fraught connections to family and childhood and memories are full of emotion. I struggled with an eating disorder for years. After I stopped binging and purging, I had to devise better ways to deal with stress than eating myself into a carbohydrate-induced coma. My fear of food and overeating caused me to repress food memories, especially any pleasurable memories associated with those foods. Actually, an important way I handled my food addiction was not only to ban trigger foods from my kitchen, but to ban food memories from my memory bank. 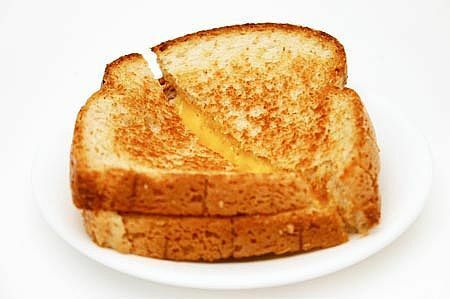 I demonized the comfort foods of my childhood: those terrible grilled cheese sandwiches on white bread with processed cheese; that horrible mac and cheese with white elbow noodles and (again) processed cheese; my Scottish grandmother’s white flour scones (they spawned years of scone and muffin eating). But on rereading the phrase, “my cooking is utilitarian,” I recognized it as a lie, and decided to investigate and begin a series of stories about the food of my childhood. I believe telling those food stories, and considering the consequences, will be another step toward letting go of food as a source of comfort. Investigation brings awareness to childhood eating patterns and how they evolve into adult eating patterns. Writing the recollections will reconnect me with the feelings I had when I ate those foods–and I believe will encourage letting go of judgments and maybe even accept the good feelings I got from eating them- and shine some light on the empty places I was trying to fill when I ate those foods as an adult. This entry was posted in Food Memories and tagged bulimia, craving, diabetes, eating disorders, food addiction, grilled cheese, scones, valerie spain. Bookmark the permalink.